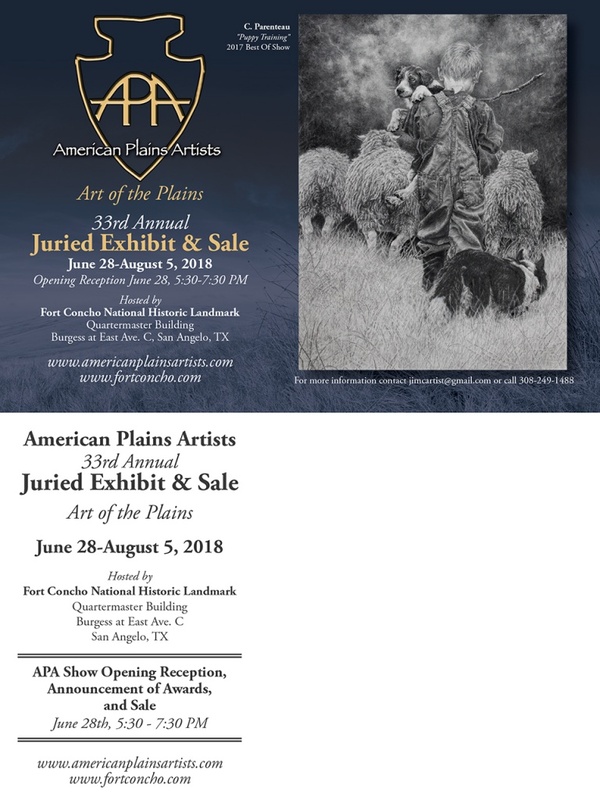 The American Plains Artists (APA) 33rd Annual Juried Exhibit & Sale will be at the Quartermaster Building at Fort Concho in San Angelo, TX, June 28-August 5, 2018, with the Opening Reception on Thursday, June 28th, 5:30-7:30 PM. The public is invited to attend this celebration of “Art of the Plains.” It will feature 112 artworks in traditional media including sculpture, that depict the landscape, wildlife, people and way of life on the American Great Plains region in historical or modern time themes. This showcase features many artworks by nationally recognized award winning artists from across the U.S.A. and beyond. Please join us at Fort Concho or view our show here!